*Why did BIG BUNNY grow so big? Nobody knows. Maybe she ate all her Cheerios. *Why did BIG BUNNY love being big? 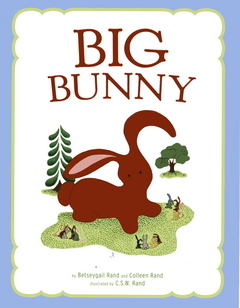 Big Bunny loved being big because the other bunnies included her in their games and invented special games they could do only because Big Bunny was BIG. *Why are the bunnies different colors? Aren’t all bunnies white? Bunnies come in lots of colors: white, black, brown, tan. In the land of Easter bunnies, all the different colored bunnies work and play together. *Why did the little bunnies try to find BIG BUNNY when she hopped away? The little bunnies loved Big Bunny. At first they did not know that she was unhappy. When they realized Big Bunny felt useless, they figured out how she could help. *Did BIG BUNNY try really hard to paint eggs? Yes. Big Bunny did try hard to paint eggs but her paws were much too big. It was very discouraging because Big Bunny wanted to help and do things like the other bunnies. *Where does BIG BUNNY live? She lives in Easter bunny land. *What does BIG BUNNY eat? Carrots, lettuce, cabbage, bunny food and sometimes Easter candy. * Is BIG BUNNY the Easter Bunny that brings my Easter basket? There are lots of bunnies in Easter bunny land. Who knows which bunny might deliver your basket? * Since chickens lay eggs and bunnies don't, why do Easter bunnies have eggs? *Since Easter eggs are chocolate, are the chickens chocolate too? No, the chickens aren't chocolate. They make chocolate eggs in their kitchen. Is BIG BUNNY just like...? *Is BIG BUNNY just like SANTA CLAUS? Big Bunny and Santa Claus both travel at night making deliveries to children. However, they are quite different. Santa is "the BOSS." Santa decides, after looking at his list of who has been naughty and nice, which children deserve presents. Then, he and his team of reindeer fly around the world bringing gifts to children who have been mostly good. Big Bunny and all the little bunnies bring Easter eggs to all children. There is no boss and there is no list. *IS BIG BUNNY just like RUDOLPH THE RED NOSE REINDEER? Big Bunny and Rudolph the red nose raindeer both help make important deliveries. But their place in their communities are different. Rudolph the red nose reindeer was rejected by the other reindeer because because he was different. The other reindeer did not let him play in reindeer games. It was only when a foggy night prevented the reindeer from flying Santa’s sleigh that they turned to Rudolph for help. Then the other reindeer loved him. Big Bunny was always accepted by the other bunnies. The other bunnies thought Big Bunny’s size was great and included her in all their games. Big Bunny felt bad because she couldn’t paint eggs or make baskets like the little bunnies. To show their love, the other bunnies figured out a way that Big Bunny could help. *Is BIG BUNNY just like CLIFFORD THE BIG RED DOG? Big Bunny and Clifford are both big. Clifford is a big, bungling, lovable dog who usually gets into trouble. Fortunately, Clifford is also heroic. His actions sometimes save the day and sometimes his human friends get him out of trouble. Big Bunny is part of a bunny community. They all play and work together. With the other bunnies help, Big Bunny is able to use her talents and size in a new way.